Part of the socio-economic and environmental development of a city involves the creation of solutions for housing, mobility, energy, waste management, air pollution control and, above all, urban green areas. Although Brazil is still moving towards this model, the country has the support of the European Union through programs such as the IUC (International Urban Cooperation Program) and Low Carbon Brazil, in which one of the projects will develop the first Rooftop Urban Farm. Brazil, specifically São Paulo, already has some initiatives of urban forests and community gardens, but in this project headed by the socio-environmental organisation Floresta Urbana, the proposal is the development of modern urban farms with aquaponics (aquaculture - pisciculture + hydroponics: cultivation of plants without soil) in the capital. “The concept of urban farm has always existed since the start of civilization, but the process of urbanization and agricultural industrialization literally expelled agriculture from cities during the twentieth century. In Europe, Community Gardens (such as Schrebergärten) in Germany were financed to support the population working in the industry to become partially self-sufficient", states Jörg Spangenberg, engineer and technical director at the Urban Forest and the 4D architecture office. The project supported by Low Carbon Brazil also provides for the use of photovoltaic solar panels to generate energy for equipment, control, pumping and lighting, and has as main objectives the reduction of water and energy consumption, generation of natural nutrients, besides contributing with population supply, clean energy production, concrete cooling for construction and decrease of urban heat islands. "Among the improvements involved in this project are access to cheap and healthy food (without the use of pesticides), reduction of CO2 emissions, less transport costs and less polluting gases being emitted, reduction of heat islands, cooling of buildings leading to decreased energy use and decreased water use, but there are other things such as quality of life, education and environmental awareness, economic development, job creation", Spangenberg adds. 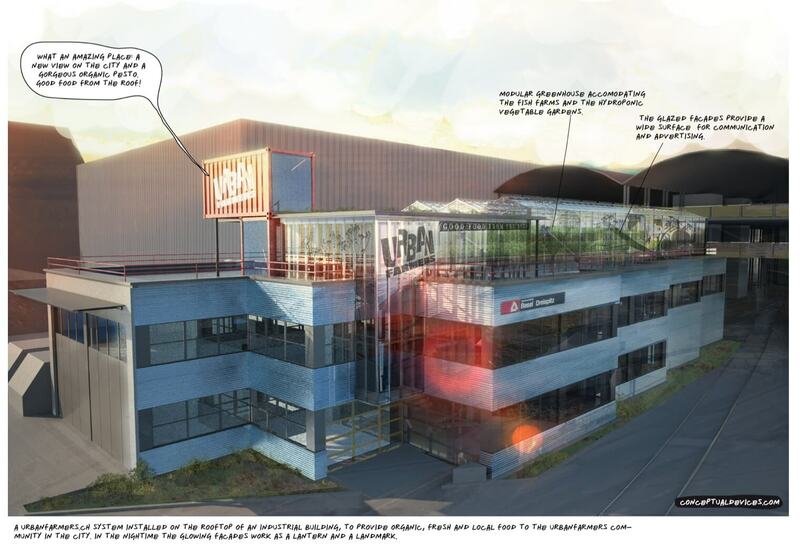 In 2012, in Basel, Switzerland, the first urban commercial aquaponic farm on roof, capable of producing 5,000 kg of vegetables and 500 kg of fish per year was delivered. In its first year of operation it used only 20.9 MWh of electricity, 32.2 MWH of heat and 763 m3 of water to produce 3.401 kg of vegetables and 706 kg of fish. 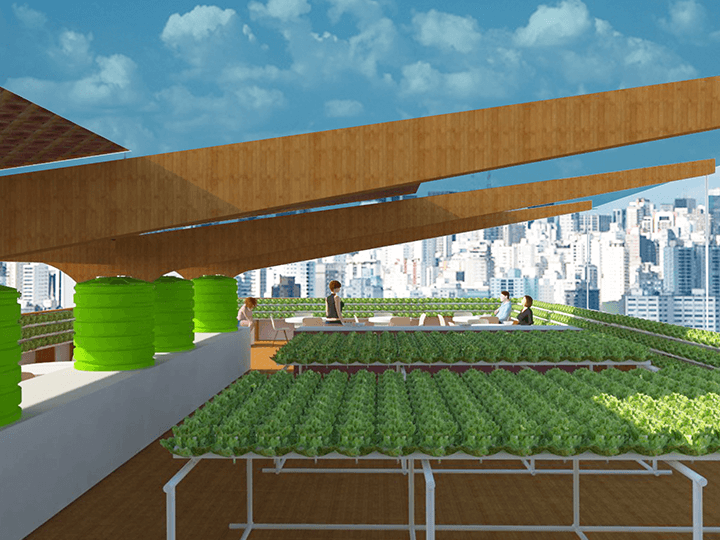 The project selected in Low Carbon Brazil by Floresta Urbana is under negotiation to be installed on the roof of a building of a major university downtown São Paulo, but the company is identifying other locations and seeking new partners so that São Paulo has more areas vertical and horizontal green areas, and with urban farms in roofs, vegetable gardens, woods, small parks, parklets and so on. "The investment for a project like this is approximately € 100,000, and there is a relative cost to maintain it, because an urban farm requires care, people for cultivating it, but it is a project with an estimated financial feedback between two and four years, as it needs to be carefully designed and maintained (finances, energy, water, nutrients, etc.) to have a shorter feedback time. That's exactly what we do! At times I tend to feel that society will need some more time to fully absorb and accept the concept and public and private initiative to visualize the improvements to the environment and the city life it promotes, but this is normal with innovative projects and this is also what encourages us to try to do it", ratifies Jörg Spangenberg.